Your office wardrobe doesn’t need to be boring, but it does need to be conservative, the minute it gets hot the shorts, short skirts and the barley there tops come out even when it is not the most flattering on your body. This, believe it or not happens often in the workplace. So, what is appropriate work attire in summer? When any of my styling clients are looking for work wear in the warmer months, my first question to them is how corporate is your workplace? Do you have to wear a suit every day or is it more of a relaxed work environment? Suit : If you have to wear a suit to work then the first thing is to make sure you have a suit in a lightweight fabric. A lightweight wool is always my first choice, as it is a natural fibre so it breathes really well and has a cooling effect, it’s also less likely to crease than linen or cotton fibers. 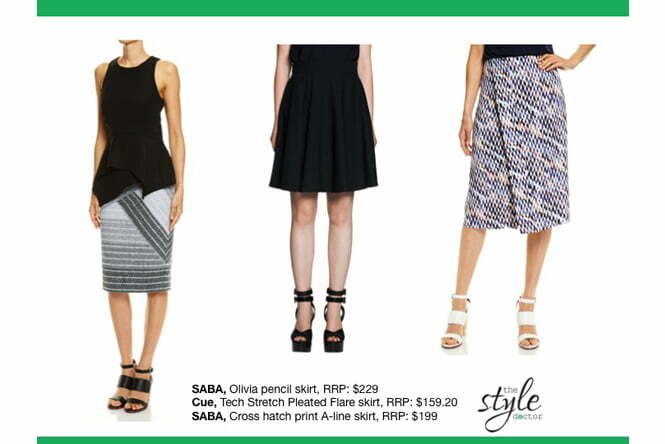 Pants and skirts : When choosing a work skirt my top tip is to not go higher than just above the knee. Pencil skirts are great and versatile, an A-line skirt looks great on petite, hourglass, rectangle and inverted rectangle body shapes. If you are more of a pear shape than opt for a skirt that is slightly flared out at the bottom and that is not too fitted. A flared pant is also a great choice. A black flared pant paired with a lightweight denim shirt, makes for a great silhouette, it suits most body shapes and is slimming and will lengthen your legs. 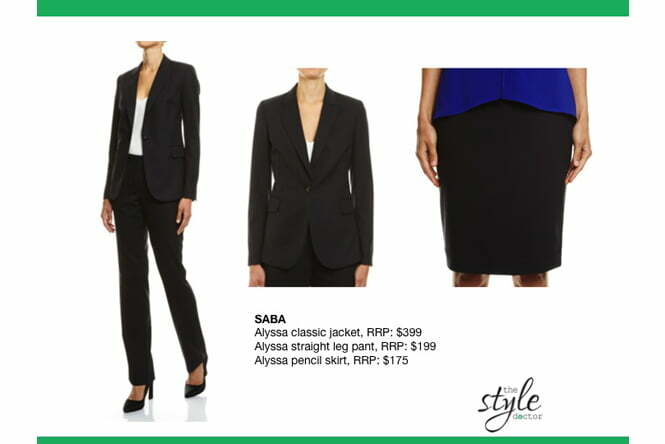 The image following is a great example of corporate wear, if you’re have a lot of plain black or navy suits and skirts try breaking it up by introducing a colour or printed top. And if you are wearing a skirt with a print than keep the top simple and opt for a neutral tone top to keep it conservative and not too loud. 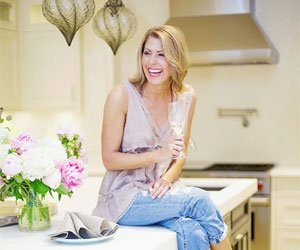 Dresses: Try finding dresses that are natural fibers including wool, silk, cotton or blends of these natural fibers for summer. My rule for showing off your arms at work is try a thick strap or high neck, leave the shoe string tops at home. If you’re not comfortable showing off your arms, try a capped sleeve as a more flattering option. 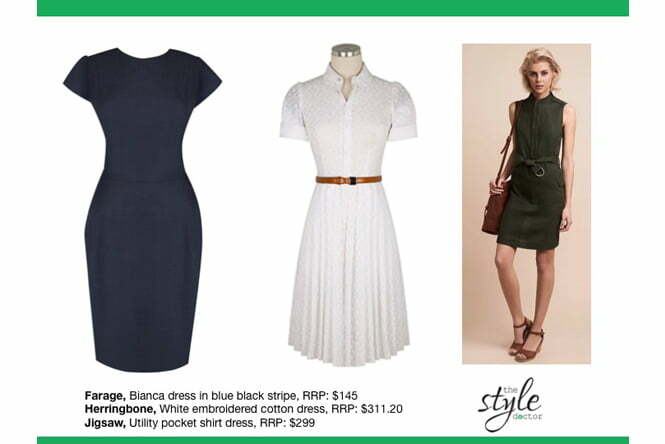 Introduce some colour and personality to a basic A-line dress by accessorising with a belt. Play around with existing belts in your wardrobe and mix it up between thin and thick styles, it will cinch you in at the waist and flatter your shape the most. Tops : As it gets warmer keep your crop tops, midriffs, strapless, low back or blackless tops for outside of work. 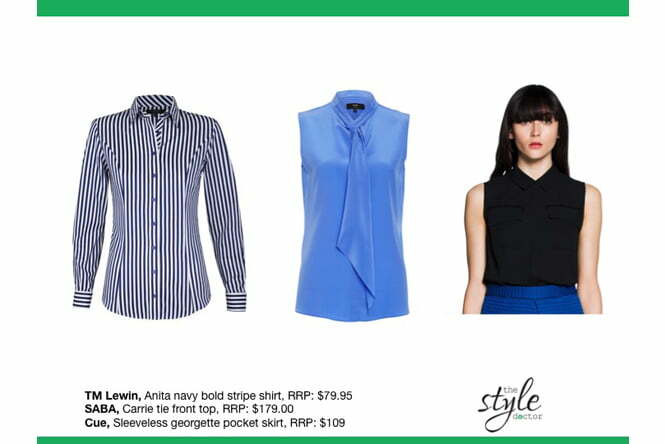 The workplace is not the place to make your fashion statement so opt for a shirt or a conservative style top. You can still wear colours or prints but choose a sophisticated and structured style that can be worn with a few different pieces in your wardrobe. A structured shirt, thin t-shirt or sheer shirt, when styled correctly with a tailored skirt or pant is not only office appropriate but can also take you from the office to after work drinks. Have fun with your summer wardrobe, and just keep in mind the heat, and what is most appropriate for the work environment. So, my overall styling tip is to find clothing that is lightweight, and that can easily be layered so you can take off pieces when the scorching sun takes its toll. Don’t be afraid to mix and match, introduce colour and contrasting silhouettes. The main thing is that you are comfortable in what you’re wearing, if you have to think twice if an item is appropriate to be worn in the work place, it’s probably best to leave it for another occasion.